. : Get a Taste of the Great Canadian Ski Adventure! :: Ski XCOttawa.ca :: Skiing in Ottawa and Gatineau Park :. Get a Taste of the Great Canadian Ski Adventure! Get a Taste of our Great Canadian Ski Adventure! We are going to have great conditions for the CSM trails, with the weather forecasts. So, if you have been sitting on the fence, now is the time to come register and come ski the beautiful and legendary trails on Feb 7,8! You can register to ski anywhere from 12 to 80 km per day on Saturday and Sunday by choosing your category and number of sections. The CSM Taster, for only $45 ($25 if you are under 18), is our invitation to you for a sample of this wonderful ski adventure. 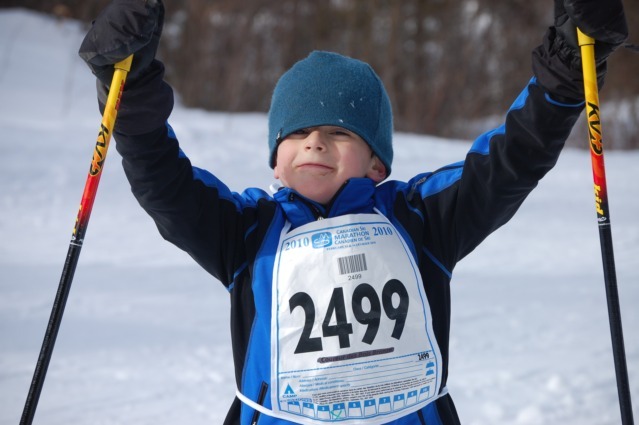 You can ski Section 5 (Saturday, 16 KM) and Section 10 (Sunday, 12 KM). Come to the Louis-Joseph-Papineau High School in Papineauville on Saturday and Sunday (usually only a 1 hour drive from Ottawa-Gatineau or Montreal) and let the complimentary CSM busses take you to the checkpoints for skiing the final section of the CSM each day. Tasty snacks and fun activities await at the Fun Finish, and the busses will return you back to the school. Fun and convenient! If you are already registered and have friends and family who wonder what our wonderful event is all about, let them know about the CSM Taster and get them to come Share the Adventure with you! Editorial: First Ski of the Season! XC Local: Gatineau Nordique Sport stone grinding and ski testing open for business! Humour: The Black Bear and You: An Australian’s guide.